If a man wanted some advice on injectors based on his end goals, the feller who would guide you right so you don't play the game of bigger fuel needs more air needs bigger fuel would be Mark Wilson at DieselTuff. He is a member here, goes by "nascar mark" - one of the founders of the old PDR outfit, solid guy, will not steer you wrong, and knows what he is doing. My useless tip of the day (I hear I'm full of these ;-) - boil the return banjo washers & injector seals in a pan of hot water for a few minutes before reinstalling, if you cont feel like buying new ones. Of course, new sticks will come with the above. Got them out. On the way to city diesel in Knoxville now. The number one was wet all the way up. The rest were dry as a bone. They came out very easy. Someone must have been in them before I bought the truck. NOW....IF a man wanted a little bigger injectors what would he buy. Right now I'm planing on just getting stock ones. Stock non intercooled injectors are good up to 400 horsepower. Greedy gods, indeed. "Upgrades" never end. May as well get them cleaned & POP'd (260 bar rather than 245 should help atomize them a tad better). 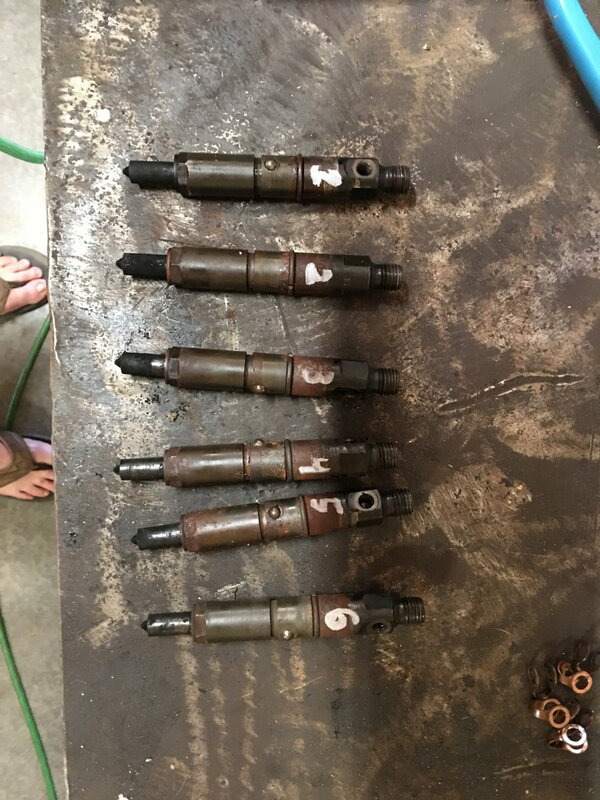 You have the 9 MM injectors that go on the '89-'91.0 motors only. My understanding is all new injectors available now are 7 MM ones, which means you will need to buy adapters. I would be careful exchanging them as it might be hard to find an actual OEM 9 MM injectors, new or used, later. What Ofelas said, about Mark Wilson, is good advice. NascarMark knows his stuff, doesn't brag about knowing his stuff, doesn't push anything on folks. Just gets you what you need, with top notch advice to go with it, for free, with no attitude! Just left the shop. I went with the stock ones. 9mm Had to exchange mine. Perfect, I have heard of people buying new injectors and trading there old 9 MM in not realizing they where getting 7 MM. Then wishing they had their 9 MMs back and the shop "can't find them".